Motormouth From Ipoh – Unveiled. Revealed. Exposed. Sort of. Hahaha …. Got ya attention there, didn’t I? Nah, still no photo of this lowly ogre hibernating in a land called Ipoh (yet). But Feedmelah.com was miraculously enticed (in my own words, not theirs, hehe) by this Motormouth, hence the fruition of this e-mail interview. Initially surprised, pleased, shocked etc to receive that e-mail from Stephen of Feedmelah.com. I was dumbstruck, dumbfounded, & plain dumb (that’s yours truly’s best trait). So it took some weeks before replying the questions imposed, which in nature, were NO mere pushovers. Imagine ‘Who Wants to Be a Millionaire’ meets ‘Are you Smarter than A 5th Grader?’ … and you’ll get my drift. Good thing was that, I was not required to send a portrait of myself. Else there goes the appetite of the millions and millions of readers. Not from my blog, of course. Feedmelah’s. Anyway, seeing that it’s a FRIDAY after all, I won’t bore you any longer with my rant, but instead would like to leave you with the link to the interview. Do hop over, have a pleasant read, browse through, print out & frame it, feign interest, spit on your monitor if you would (but you wouldn’t, right? *puppy-eyed*) and do leave a comment at the end of the post. So Stephen can keep his job, and as the Cantonese saying goes, wont’ “Drop His Glasses“. 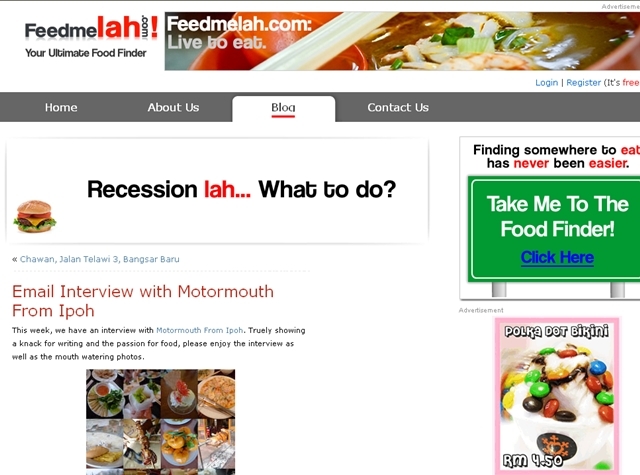 wow, Motormouth has become celerity blogger…anyway, you’ve done a good job…the best Ipoh food blog!! Done my duty – commented liao, hehe! Congrats, makes me proud to be a Ipoh-mali blogger too, haha! Gong Hei Gong Hei…this calls for a celebration. wah…another blogger become celebrity…first in ipoh? Congrats! for the salted chicken, is it in a coffee shop where i can buy and eat on the spot? also, do they serve rice and other dishes? hey motormouth! u’re so famous now..haha! don’t forget us here when u become a celebrity next time..haha! Congratulations!!!! Well done, you deserved that! You sure make us Ipohans proud out there! so cute… of course il go read it..
wow great! congratulations! i knew u r great from d first time i read yr post (which i stumbled upon when i google searched on akamomiji) & straightaway bookmarked yr blog to read thru all yr previous posts & hv been following ever since… it has since been getting better & better… besides being a good writer, u r also a good photographer! congratulations!